We are off to a great start at the U18 Canadian Championships, at the top of our pool at 3 wins, no losses. The ice at the facility has been fantastic and the competition has been great, we have had to work hard for our wins. We started our third game 3 handed as our skipper had been feeling under the weather and was at a medical clinic. We were digging in for a long game against PEI when he surprised us all by showing up for the 4th end and entering the game. The team was getting the job done 3 handed but getting back to our normal line up and 2 sweepers was a relief…. as there were a few shots where we needed both Braden & Ethan on the brushes! We have the morning off and meet a tough team this afternoon at 2pm (Team Alberta) so hopefully the meds have kicked in and Jayden has had a good rest (he was quarantined to his room for some R&R after last nights game)! We have lots of friends & family here cheering us on and are meeting curling fans from all over the country! It’s been fantastic! 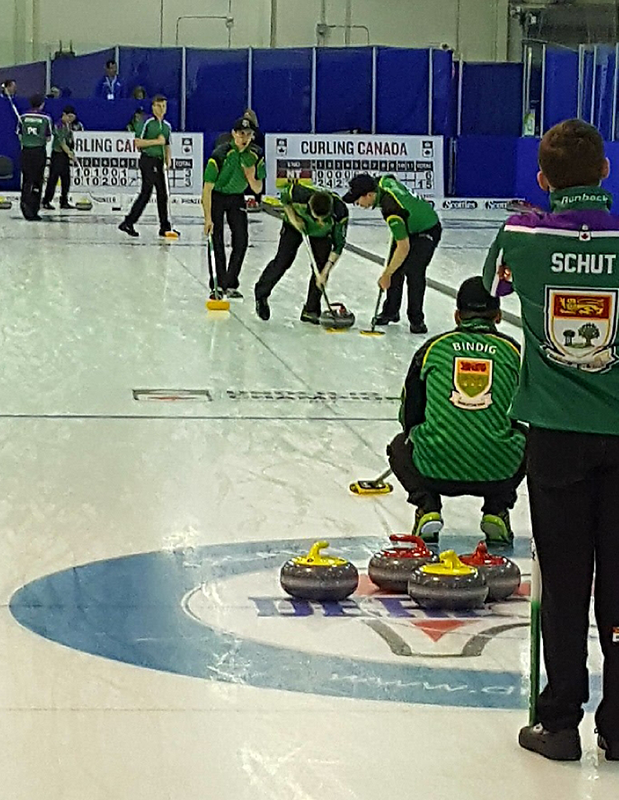 We are the feature game Friday morning at 10am so if anyone wants to watch Curling Canada’s Broadcast of our game at their YouTube Channel, click here.